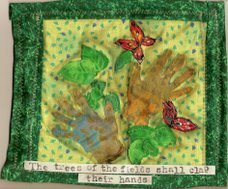 The September themes for the quilties swaps include "Shades of Yellow". 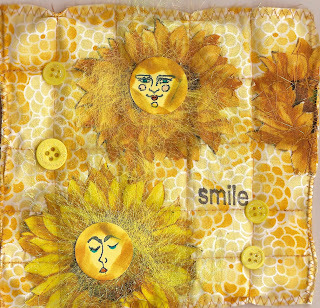 I fussy cut the sunflowers and backed the paper faces with Angelina Fibers. I love sunflowers and when I saw this fabric in my stash, I knew I wanted to do something with it. a wonder because my mother hated them! ") (I can remember her looking at material/wallpaper and finding tons of them and muttering under her breath "damn sunflowers!") This piece is so sunny and bright....love it!